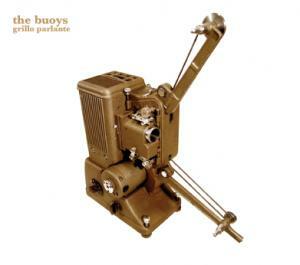 The choice of using an old cinema projector to adorn the cover of Grillo Parlante, the debut album from Midland-based unit The Buoys is hardly fortuitous. Indeed, Chris Cousin, Stu Smiths and Steve Gibbs have all been involved in various projects involving or relating to films. Beside a stint as SofaLofa last year, Cousin is also a regular member in folktronica trio Chin Chin (Deep-Water), electronic outfit Normal Position (Ai Records) and Big Toe. He most noticeably performed at Leicester’s Space Centre last year with video artist Sean Clark. Gibbs is better known for his dub project Vibronics and as head of Scoops and Zion Trains Universal Eggs labels, but he has also composed for theatre and art installations, while Smiths has worked as a cameraman and film editor. Combining soft ambient electronic soundscapes, occasional found sounds and guitar textures, at times vaguely reminiscent of Robin Guthrie, into quietly cinematic and ethereal pieces, the trio build here a rather convincing series of largely beat-less tracks which fluctuate between introspective pieces, experimental vignettes and sweeping compositions. On the opening track, Absolutely Nothing, a lone guitar floats just above dense clouds of static noises, interferences and drones. Although it never manages to lift off from the rest, the contrast between the surface melody and the dark overtones in the background sets the tone for the rest of the album. Arches continues pretty much on the save level, but the mood appears to lighten up slightly as a drum sequence enters the scope and give some structure to the otherwise vaporous soundscapes surrounding it. Beyond this point, the music becomes much more fluid and unpredictable as the band abandon pretty much any concrete rhythmic component. Instead, they rely on much more refined musical forms and, as the pace slows right down, especially on tracks such as the rather splendid Spider, Dehli Handkerchief, Solar, which is sweetened by the gentle vocal layer provided by Chin Chin singer Theresa Connelly, or New. By the time Grillo Parlante resurfaces, the mood has turned rather pastoral with Forman, giving an insight into a slightly different incarnation of the trio’s musical ability. This is reinforced on Wrist as the band wind down and take leave. Grillo Parlante has been pieced together with great care and the music reflects a taste for sumptuous yet often minimal soundscapes, with delicate melodies creeping up out of nowhere. The cinematic aspect of the work here is undeniable, and contributes to making this debut album a truly compelling collection of fine atmospheric electronic music.